Join the fun to reshape your nutrition, your mindset and your body by committing to a 5-week challenge. Earn accountability points (AND the chance for prizes) by sticking to healthy eating rules, working out and making small lifestyle changes to better your health. AND, you’ll get a before and after InBody Body Composition Scan to help you understand your body’s muscle, fat and water composition. When it comes to nutrition we sometimes need a jump-start to get out of the “what in the world have I been eating?” rut. We recognize everyone has specific nutritional needs, however, we believe there is an outline that works best for most people – whole real foods. This includes lean proteins, plenty of vegetables, some fruit, healthy fats, and lots of water. There are a plethora of options when it comes to eating real foods. Think of these five weeks as an opportunity to learn what foods make you feel yo’ best! This challenge is completed individually however everyone is strongly encouraged to have an accountability partner, which will allow you to gain more points and stay on track. Start this season off strong by building good habits and mindset with the support and encouragement of our challenge director and the entire group of participants. AND, though your improved mindset and body is the REAL prize, you have the chance to win a FREE month of FitWit of you AND a friend! InBody Measurements – Saturday April 21st 8a-12p and Saturday May 26 8a-12p. (If you can’t make this window work, contact Maddie ([email protected]) to schedule a time. Healthy Cooking Tips Class, with Michelle Skalka. Learn tips and tricks to make all your healthy eating taste great! FIVE focused weeks to improve your diet and lifestyle habits! Members: Kirkwood FitWitters pay here & O4W FitWitters pay here. After paying, schedule your Inbody Body Scan appointment HERE for Saturday, April 21. Please see the Whole30 Program Rules for descriptions of each of the foods to eat and those to avoid during the challenge period. This will serve as our guide book for the challenge. Use these rules to build better habits. For some, these rules create a reset for eating well. For others they represent paying attention to what they are eating for the first time. 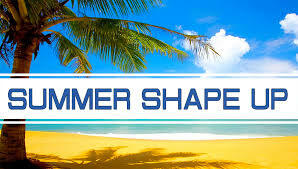 Please be sure to download and print the Summer Shape Up Calendar in order to keep track of your tasks and overall points. The calendar is designed to help you develop lasting nutrition habits and to encourage you to stay focused during the five week challenge. A healthy mindset and focus can help lead to discipline which leads to lasting change. Print or download the Summer Shape Up Calendar. To make sustainable change, it is important to build healthy habits one step at a time, one day at a time. The Challenge Calendar is designed to help you gain points on a daily basis by completing small attainable tasks. These tasks may be focused on nutrition or wellness habits. Every day you have the opportunity to gain one point by eating clean, which means following the Whole30 Rules. There is an additional task everyday that will allow you to gain two more points each day. We recognize some of the tasks may be difficult to complete on an exact date to do your personal schedule and commitments. As long as the task is completed with in the designated five weeks of the challenge you may count is as complete. For example, on 4/28/18 the task is “to sleep at least 7 hours”, you are allowed to change that to 4/30/18 if that is more convenient. Some tasks are repetitive, for example “Drink ONLY water” is on the calendar twice. This means you have to complete each of these two times, you cannot count completing the task once to additional dates. You are responsible for keeping track of your individual points every week for the calendar and to update your points on the Online Point Tracking Form which will be sent to you weekly. At the end of each week ALL participants who have accumulated at least 17 points for that week (max points per week is 21…though there maybe some bonus points thrown in from time to time) will be eligible for a weekly raffle. In order to be entered into the raffle you must enter your weekly points every Tuesday by 6pm (the first raffle will take place on 5/3/18). The person with the most points will win personal chef hours with Clean Plate Club Atl. This session will include recipe and menu development and an in-home cooking lesson. Second place winner will receive an Paleo Meal Pack from Edesia Meals. The top two people with the most overall fat percentage lost (calculated as Body Fat% #1 – Body Fat% #2 / Body Fat % #1) will receive a ONE MONTH FitWit membership, plus a ONE MONTH membership to gift to a friend.